In December 2018, I was thrilled to become the Vice Chair of the CIPR Inside committee. In that role I support the Chair in ensuring that everything we do supports our mission of furthering the internal communication profession. That includes providing resources and events to help our members excel, conducting research and championing continuing professional development. In 2017, I was part of the team that conducted research into how CEOs value internal communication. You can read the full report on the CIPR Inside website. I’ve thoroughly enjoyed helping to organise the Institute of Internal Communication’s (IoIC) annual conference for the past seven years. In that role, I help scope out the theme of the conference, confirm speakers, organise sessions and support promotion, primarily with social media. For the last two years the IoIC has asked me to judge categories as part of their annual awards. It was a real privilege to witness the fantastic work of all the entries and to choose a winner. And in 2017, I was a judge for a category in the European Association for Internal Communication awards. 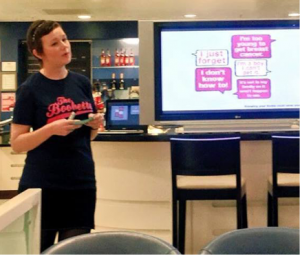 Following my breast cancer diagnosis in 2014 at the age of 29, I started volunteering for CoppaFeel! to raise awareness of breast cancer in young women. CoppaFeel!’s mission is to make sure all breast cancers are diagnosed at the earliest stage possible, making treatments more effective and survival rates higher. I visit schools, colleges, businesses, and community groups to spread awareness among young people. We’re a group of young women aged between 18-35 that have been diagnosed with breast cancer, have had a scare or are passionate about spreading awareness. We share our own experiences in order to increase awareness of signs and symptoms, spread the importance of self-checking from an early age and empowering young people to feel confident about speaking to their GP if they spot anything abnormal. In 2017 I wrote a book for the charity Miller’s Stars that aims to support parents affected by stillbirth. 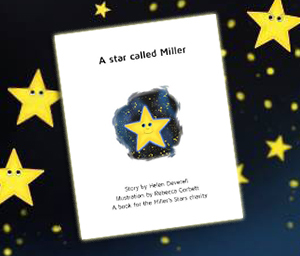 The book follows the story of a tiny star called Miller as he tries to find out who he is and where he came from. All profits go to the charity. The illustrations are by the exceptionally talented Rebecca Corbett.